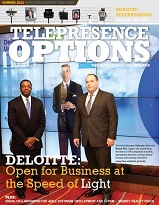 Welcome to Telepresence Options Magazine! Telepresence Options Magazine is only print publication focused on videoconferencing, telepresence, unified communications, and visual collaboration. 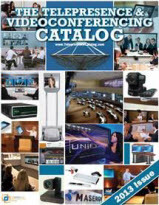 The Telepresence and Videoconferencing Catalog is the most comprehensive buyer's guide for visual collaboration solutions. Our Online Catalog is annually accompanied by a hard copy sourcebook. Subscribers get immediate access to all of our publications online, and will receive free physical copies of our 2014 print publications. If you have already subscribed, you may proceed directly to our Online Archive. In this feature story for the 2013 Telepresence Options Magazine one of the industry's most sophisticated VNOC architects explains what it takes and provides "news you can use" including 11 helpful tips from a B2B / B2C playbook. This exclusive is available below for free, in its entirety. The ballerina, the danseuse, the prima ballerina. To the audience, she is grace itself, flowing with seemingly effortless poise and practiced refinement. But behind each minute of flowing charm and striking beauty are hours of choreography, tedious planning, sweltering recitals, and plain hard work. Developing a B2B service is a bit like that. Read through to find out how. For more great coverage of Visual Collaboration technology, please check out the entire 2013 Telepresence Options Magazine. Copyright ©2013 Telepresence Options. All Rights Reserved.